Since STP Shipyard Palma carried out the necessary steps to enable a space for a Cáritas container to collect unused clothes, which are then given to the neediest or most disadvantaged groups in society, it hasn’t stopped accumulating kilos and kilos of donations. 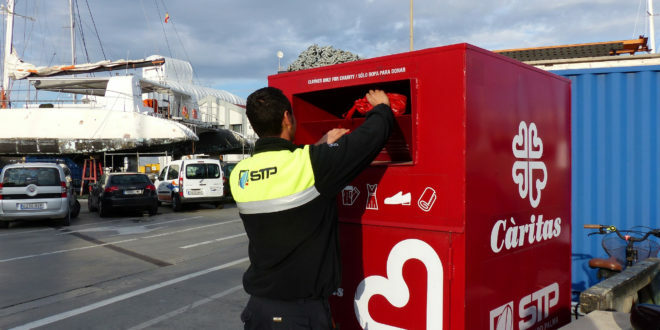 This initiative taken by STP Shipyard Palma was driven by several factors, especially to the ‘Operation Kilo’, the main campaign in which the yard manages to collect hundreds of kilos of clothes in just a few weeks, thanks to the collaboration of clients, employees, suppliers and partners operating within the facilities. In light of these fantastic results, and keen to help out by providing clothes throughout the year, and not just at Christmas, they will continue throughout the year. From the moment of placing the container at this collection point, it proved to be very successful. The Cáritas container is used permanently to deposit sealed bags of textiles, whether clothing, footwear or accessories that anyone who passes through the yard no longer uses. And thanks to the generosity and sensibility of everyone, in just one year it has collected almost 4.000 kilos of clothes which will receive a second use. This Cáritas project seeks to recycle unwanted clothes by selling them at very affordable prices at charity shops, donating them to the neediest in society, or recycling any items not up to the mark for resale or reuse. Besides responding to a basic need of many people without resources, Cáritas also creates jobs with this project by fostering employment for disadvantaged people in the recycling process or the sale of clothes. STP Shipyard Palma and everyone working within the site, whether employees, crews, partners or companies, have been very pro-active in supporting this social outreach project. Their generosity has truly been awe-inspiring, and we would like to take advantage of this release to express our heartfelt thanks. At the same time, we want to encourage them to keep continuing with this collaboration and try to exceed the amount of kilos donated by the end of 2018.